We live in exclusive times! Or should that be exclusionary? Two major Indigenous events announced in Sydney this week turn out to be less than they appear in that they offer, respectively, “indigenous history, feeling and disturbing visions that reach into our lives” and “bringing together indigenous art and culture from around the nation”. But it's almost all urban art on offer. Perhaps there's a give-away in the titles. For, in my eyes, both Debil Debil (at the Anna Schwartz Gallery until 8 June) and Corroboree (a festival in central Sydney in November) are rather demeaning White words or adoptions for important Indigenous concepts. Why, apart from a token presence, would you choose to leave out the cultural riches of remote Northern Australia from any Indigenous cultural event? It's particularly egregious at the NSW Government's Corroboree festival, taking up 11 days in November. For the two Ministers involved in its launch were clearly mislead. George Souris, Minister for Major Events (and, occasionally, the Arts) made the above declaration about bringing Indigenous art and culture from around the nation to Sydney, and his Aboriginal Affairs colleague, Victor Dominello concurred with reference to “Aboriginal people and communities throughout Australia”. But Artistic Director Hetti Perkins (ex AGNSW) sees it differently: “Corroboree has at its heart the local culture of Sydney city and by association the wider Sydney area and NSW (which includes remote communities). It does aspire to embrace our cultural diversity nationally, indeed many of the partners have connections outside of NSW. Bangarra's program, for instance, often draws on Yolngu culture for inspiration, and some of the dancers are from remote communities. Essentially, the festival supports local cultural expression within the national context”. What a fabulous opportunity is thus lost to open up some of the mysteries and complexities of tribal Aboriginal culture for the Sydney (and tourist) gaze. For I fear that when tourists in particular are asked what they really wanted to see in Australia – and 80% of Germans and 39% of Chinese came with an “interest in Indigenous cultural products” - they weren't thinking of urban Sydney's Blak art. And sadly, “37% of international visitors expressing ‘high’ or ‘medium’ interest in Aboriginal tourism left Australia without participating in an Aboriginal tourism experience”, according to the Survey of Indigenous Tourism 2000 by the Bureau of Statistics. Corroboree is funded for 3 years. No one is denying the political or conceptual power of some of the art that Prof. Marcia Langton has selected for the Anne Schwartz Gallery's show Debil Debil. But then Langton is a very political and conceptual person, with her recent Boyer Lectures proudly touting the middle-classing of Aborigines like herself living in the South. And, like Hetti Perkins, she's chosen to draw a line in the sand and exclude the North – despite many a kadaitcha man in the Desert or Mimi spirit in the rock crevices and bark paintings of Arnhemland. Sure, there's a handful of Nawurapu Wunungmurra's threatening Mokuy sculptures in bronze from Yirrkala to 'welcome' visitors to the exhibition, opening a life and death/death in life dialogue dramatically. But they're a lonely outpost of tribal thinking in the face of walls of Western art tackling Indigenous issues beyond them. 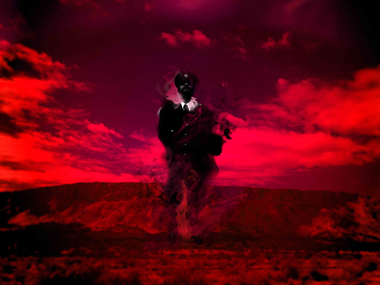 Closest in spirit to the Mokuy is Warwick Thornton's set of photographic images from Central Australia, replacing traditional soul-stealers of the night with himself in diabolical guise as churchman, cop and cow-cocky...the 20th Century's Debil Debils coming to take you away by day. Meanwhile, big blond Danie Mellor offers a really thought-provoking look back into his racial past in the Rainforests of Northern Queensland with – I think for the first time – its short Negrito people (as Norman Tyndale categorised them) bravely facing life amongst mighty tropical trees – all given Mellor's trademark blue and white china colouration. Photographer Darren Siwes also offers novelty and laugh-out-loud humour in his white-face images of Aborigines as toffed-up royals. 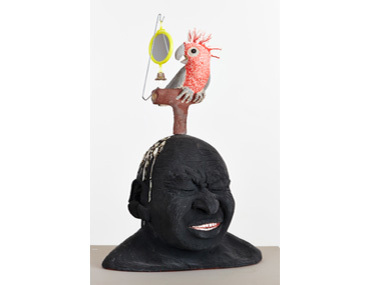 The Torres Strait's Ricardo Idagi – resident in Melbourne – has departed from his turtle-shell works to model what looks suspiciously like his own head surmounted, Long John Silver-like by a Pretty Polly. It's meaning escaped me – but I laughed! It'll be fascinating to see what Anna Schwartz's ultra-contemporary crowd makes of Marcia Langton's curation. Will they laugh? Will they feel they've had an 'Aboriginal' experience? 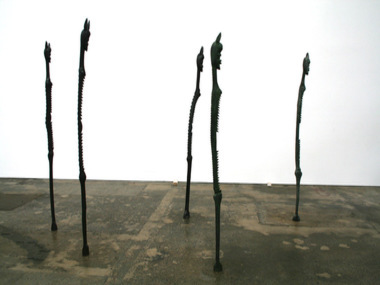 Or will they receive an artistic thrill akin to Schwartz's recent shows by AES+F, Yinka Shonibare and Anthony Gormley? It's unrealistic for Aboriginal people to expect others will stop portraying us in photographs, films, on television and so on. Rather than demanding an impossibility, it would be more useful to identify those points where it is possible to control the means of production and to make our own self-representation”.